simCEO: Social Learning: Learning from and with one another. Social Learning: Learning from and with one another. We founded our company with the core belief that learning in schools must to be naturally engaging and mirror the skills of the real-world to promote intrinsic student motivation. That belief has guided us in creating a learning experience with five unique features. Learning - for tomorrow - needs to have these elements. 5) Empowering instructors to customize learning experiences for their students. Earlier, we shared the ideal elements needed to move from student recall to students who create solutions with content. It takes an open-ended, real-world, engaging problem with critical thinking and decision-making at it’s core. Our post today focuses on social learning. Those types of learning experiences can no longer exist only between teacher and student. Students need to see - and learn from - how other students try to navigate these experiences. In short, we need to move from the one-to-one teacher:student model to the many-to-many model. Teacher tutors one. Provides task. Teacher provides feedback, evaluates, and returns work. Student turns in work. Student receives feedback. Teacher gives lecture. Online tutorials. Student solves a problem on a blog. Students gives verbal presentation. Guided/Socratic discussions. Online chat room. Team sports. Help forums. Online mult-player games. What defines quality experiences in the many to many model? In it’s simplest form, it embodies the essence of Bandura’s social learning - allowing learners to learn in a specific context through imitation and modeling. In it’s best context, there is a blurred line between the expert and learner. Everyone accepts responsibility for both roles. Our best learning environments allow students to learn from - and with - one another. 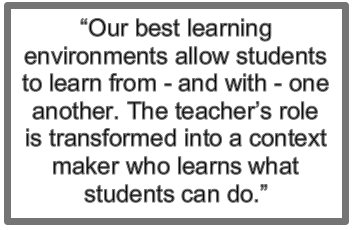 The teacher’s role is transformed into a context maker who learns what students can do. We created simCEO with this idea in mind. Give students an authentic goal with many possible solutions, and allow them to learn from the diversity of opinions they see. It’s both blessing and a curse. Teachers love the creativity simCEO fosters. Students create their own business to thrive in a specific environment / context. And, they see (and learn) how each other approached those same problems and came up with different solutions. Students make adjustments to their own business which model best solutions for their own context/business. Students see news articles and recognize that changes affect each company differently. They adjust their business plan and their investment philosophy to these changing conditions. Equally important, they see how other students react (differently) to these same news articles. But we also see evidence of intelligent, committed educators who struggle finding the best way to “tie it all together.” Open-ended learning can sometimes feel like trying to pin down a cloud. Perhaps this is compounded with online, open-ended learning. How can I effectively assess micro vs. macro entrepreneurial student decisions, and evaluate each accurately? For example, Student A sets up the “right” business for a particular environment but cannot understand or apply supply and demand. Student B has a poor business idea but applies his knowledge of supply and demand beautifully. How can I measure the quality of business plans - or adjustments to those plans - within a dynamic environment? How can I separate (and evaluate) lucky actions and adjustments from competent applications of knowledge? Open-ended tasks are complex and more than a little messy. They are filled with what if? moments where students make choices and go down various pathways. That doesn’t always lend itself to easy assessments. But those are the real-world environments our students need navigate. We continue to seek out feedback from educators who have ideas for how to best evaluate within these open-ended environments. But let’s not forget. Learning experiences with discrete outcomes may be easier to evaluate, but those experiences offer little context for social learning. We can’t aim for “right” at the expense of “meaningful”. Our first simulation, simcEO, product targets entrepreneurship and financial literacy as students create their own companies to form an interactive stock market, and then buy/sell shares in each other's company to influence the share prices as they react to news stories - real or fictional.